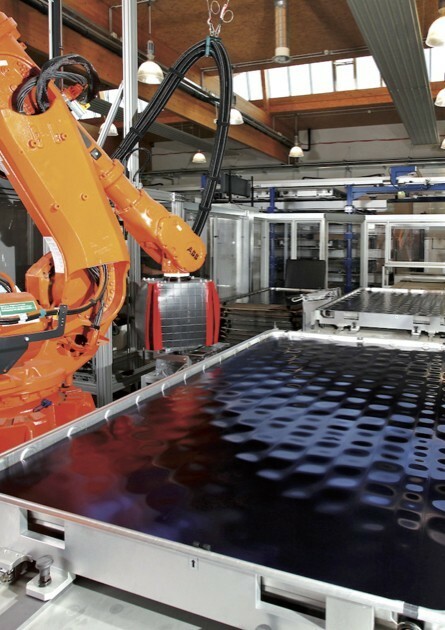 Our collectors are assembled in highly automated robotic production lines. The latest laser and ultrasonic welding technologies are used for absorber production. These technologies were developed by our in-house tooling and plant technology department. GREENoneTEC collectors are based on defined technology platforms that are produced at a coordinated industrialisation rate. From robotised production systems with a high level of automation to custom-made, project-specific collectors: all our products are manufactured in line with industry quality standards. Currently we manufacture more than 100 different models as customer-specific OEM versions. The GREENoneTEC manufacturing technology for full-surface high-performance absorbers is unique in the market and therefore provides the basis for the decisive advantage of our collectors. Our meander registers are formed in the fully automated meander bending plant; the harp registers are completed using a fully automatic soldering machine. Laser and ultrasonic welding technology – Based on multi-stage quality assurance procedures, our production has been designed for industrial mass production and relies on optimized laser and ultrasonic welding technology and a highly automated copper and aluminium semi-finished products manufacture. As the first company worldwide, GREENoneTEC has developed an automatic 4-head welding system for absorbers. The system welds 4 seams in parallel, i.e. 2 pipes at the same time. Within one hour 40 absorbers can be produced, making the system the fastest laser welding unit in the world. High quality collectors also need an optimal fastening concept. For all collector families GREENoneTEC supplies the best possible fastening systems and accessories for all roof-mounted and free-standing installation types. In the design and the materials, the focus is on short installation times and maximum safety in accordance with EN 1991. The kit sizes and packaging are tailored to customer-specifi c logistics requirements. We offer specific kit types according to individual customer requirements and the associated manuals with all installation steps with clear image / text passages – on request in the corporate design of our customers.